Forest Road 253 is located in the Grand Mesa National Forest near Grand Junction, Colorado. The road begins off of Highway 65, just east of Mesa Lakes, follows a valley for about a mile, then climbs a long switchback where it rejoins Highway 65 near the top of the Grand Mesa. FR 253 gets very little use from vehicles or anyone else but as you will see it has its redeeming qualities that make it worth checking it out. The turnoff for FR 253 is easy to miss. After passing the turnoff for Mesa Lakes Lodge, which is about 13 miles north of the town of Mesa, Colorado, you will come to one turnoff to the right followed by another. Be sure to slow down at this point and watch for the next turnoff to the right that has a stop sign and drops quickly off of the highway. If you come to the turnoff for the Spruce Grove Campground then you went too far. 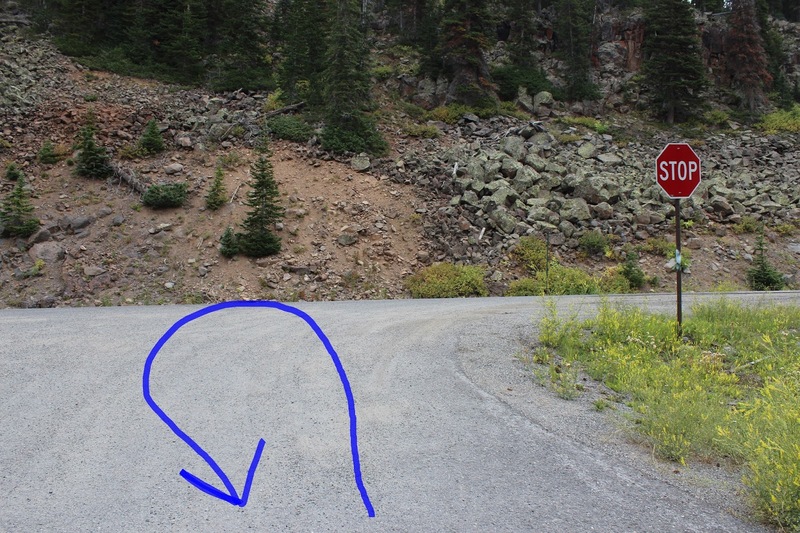 And, if you overshoot and have to turnaround consider driving all the way past it again and turn around at Mesa Lakes or Jumbo Reservoir before trying again. Making a left turn off of Highway 65 is hard to manage and can leave you cross ways in the middle of the highway trying to jockey around. Once you see the road you might be surprised at how nice and wide it is. FR 253 was actually part of the Old Grand Mesa Road which served as the main route up the Grand Mesa for decades. This is the route we used to take when we were kids. As the road bends around the mountain you get a birds eye view of Mesa Lake and the surrounding area. At one time there was a ski area here with a tow that pulled people back up the mountain. There are orange diamonds on the trees that designate the snowmobile route that leads from Mesa Lakes Lodge to the top of the Mesa. The squirrels are kind of funny to watch. They climb to the tops of the spruce trees and strip off the pine cones and drop them to the ground. Then they tear them apart to get at the seeds that they store up for the winter. As you travel further up the road the land opens up into a valley. During early morning or evening hours you may be able to spot deer or moose out in the open or you might just get lucky and catch something traveling through the area in the middle of the day like we did. After passing a small lake and camping area on the left at the end of the valley the road begins its long gentle climb. There are several more camping areas along the road in this area. As the road climbs the effort is hardly noticeable. Maybe that is because you get caught up gawking at the scenery or eating berries. The road rejoins Highway 65 near the top of the slide area below the rim of the mesa where we turnaround and head back. On the way back we spotted 2 bull moose out in the open near a small pond at the lower end of the valley. We let our telephoto lens bring the moose in closer for a few pictures while keeping our distance. Over the years we have had several other close encounters with bull moose while in Wyoming and Alaska and you can never predict what they are going to do. We have had them come at us, watched one lunge through a 12 foot high fence to get away, and had others just ignore us and go about their business. I have also heard of them charging vehicles. Cow moose are just as unpredictable. We remember a lady in Anchorage that accidentally road her bike between a cow and calf and was stomped to death as a result. Hiking times may vary depending on how many raspberries you eat along the way. We had also spent about a half hour sitting along the side of the road to see if the moose would come back out in the open. We could hear them breaking branches in the trees and if you watch the slideshow you will see that we caught another glimpse of them in the trees. If you follow the road for about 100 feet after pulling off of Highway 65 you will find some wide spots to park. There are a few raspberry bushes in this area also. We only encountered one vehicle in the 2 1/2 hours we were hiking so we pretty much had the place all to ourselves. Some people might think hiking along a road doesn't sound like much fun but we found it as enjoyable as most other forest hikes. And we got to see a couple of Bullwinkles. (Too bad the squirrel wasn't wearing a pair of goggles.) If you would like to see it for yourself then all you have to do is 'Take a hike'.